An evening potluck was held at J. D. and Joan Shipman's garage in Webster on June 28th. 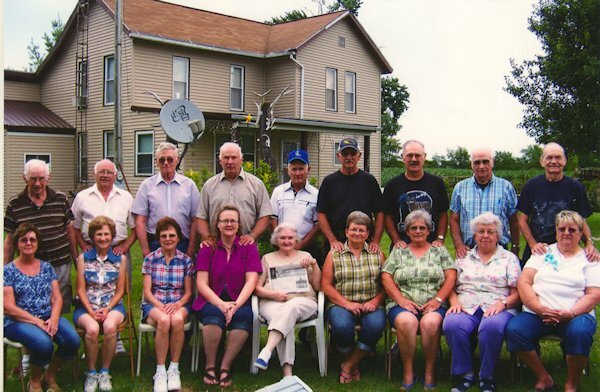 The cousins gathering to laugh were: Iola, Cecil Shipman; Sonja, Henry Shipman; Janet, Carl Shipman; Clifford Shipman; Shirley, Paul Gorrell; Jo, Darrell Shipman; Dixie, Bill Shipman; Carolyn Read; Viola Henson; Charles Shipman. We missed having sister Carlene, Wilbur Scheuermann with us. Back row pictured from left to right: Carl, Clifford, Paul, Darrell, Charles, Bill, J. D., Cecil, Henry. Front row: Janet, Carolyn, Shirley, Jo, Viola (holding "The Quill"), Dixie, Joan, Iola, Sonja.